Maybe we should have left things as they were, but then if we settled for second best we wouldn't be going racing in the first place. With everything up and running as we had hoped for, we went to Millbrook, the Independent motoring test facility (as used by the likes of 5th Gear amongst others) for some shakedown runs. 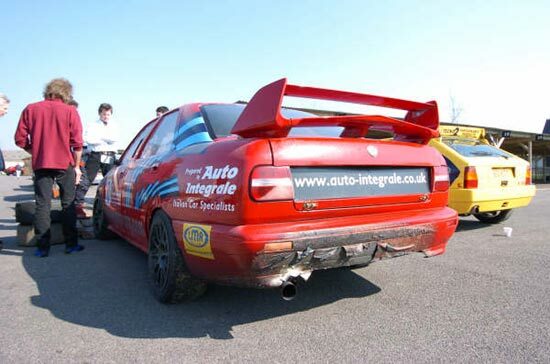 A few runs up and down the mile straight showed us that we had almost zero traction until the tyres warmed, that 150mph came up in a very short space, and that the engine was delivering all we had wished for. We ventured out onto the skid pan for about 20 laps (until we span out) but proved that the Accusump was maintaining oil pressure no matter what. A couple more runs up the mile straight (it was so addictive) ended our day, but on the final run there was a hiccup flat in 4th so we shut down. The k drove back to the trailer fine so we thought nothing more of it. Feeling the need to REALLY impress at the forthcoming Lancia Motor Club event at Goodwood, we sent the k back to Owen Developments to have the electronic boost controller fitted and a remap carried out. This wasn't without its problems - it became apparent that the fuel pump was failing, which would have had disastrous consequences, so an uprated Mitubishi Evo one was fitted. The fuel pressure regulator wasn't fairing much better and went the same way. Finally a check on the plugs showed missing electrodes, missing porcelain, not a pretty sight. What should have been a simple couple of hours work ended up more like 6 or 7, and then it was ready. The moment of truth came as the printer drew out the new graph. 413 bhp at 5500 coupled with 390 lb ft at the same revs using 1.6 bar of boost! That was more like it, no need to even rev the engine hard. A quick trip back to Auto Integrale for final setting up and checking over and then we were ready. An early morning run down to Goodwood, the fog near the circuit had lifted by the time we got there. The kappa was getting good comments from my fellow Lancia Motor Club members. Scrutineering was predictably a breeze and the noise test result a pleasant surprise, only 90db, the noise tester expressing his surprise that such an obvious-looking car was so quiet. Our slot soon arrived and with Keith strapped in as guinea pig passenger we were off. The intention was not to set any speed records early in the day, quite the contrary. We wanted to know that everything was OK, to see what traction out of corners was like, and turbo lag, and to bed in the new brake pads. we set off at approximately 15-20 second intervals and we were 4th out. We caught the Porsche 911 coming into St Marys for the first time, to be fair the driver wasn't going that quick and we followed it through Lavant before opening up the k. In next too no time we were pulling over 6000 in 5th (150mph), so long since I've driven at Goodwood I felt it wise to lift off and look for Woodcote - it was still a long way off. A good exit from the chicane suggested good traction, all 400+bhp put down in second gear without fuss, although some of the onlookers thought we were lighting up the front wheel. Couldn't tell from the inside, she just pulled. Carrying on in our same fashion, lifting off early and braking gently, we caught the next two cars over the next two laps and then we were free. And then it all went wrong! As we rounded Magdwick and got back on the gas, the engine went bang. A big cloud of smoke and then the realisation that we were on fire - 3 feet long flames were visible in the mirror coming from the exhaust. I mentioned to Keith that he should get the fire extinguisher ready and be ready to get out fast. That's when I realised that pulling the kill switch might help - all that fuel was going straight down the exhaust and igniting, flame thrower style. We stopped on the track down at Fordwater, didn't want to set light to the grass and then the k, and Keith put out the fire at the back. And then another one at the front as I lifted the bonnet to see a small oil fire. We were standing there all smug, but cursing waiting for the marshals to arrive when we realised the k was still on fire underneath. That emptied out the extinguisher and finally we were towed back to the paddock. One of the marshals handed us bits of conrod we had dumped way back on the track, and when we removed the front bumper assembly, we found the oil pump drive resting there. The front of the car was relatively unscathed, what turned out to be one silicon hose and the radiator fan burnt, but out back all the paint on the rear bumper had been cooked, one tailight lens was melted and even the rear spoiler showed signs of fire damage. The autopsy back at Auto Integrale predictably wasn't good. A conrod had snapped but the engine had carried on running. The errant rod bashed holes through the front and back of the block and through the sump. Its piston had been bashed upwards into the head ruining the piston and a couple of the valves. We may be able to salvage 4 of the pistons and we've got the cams out. Keith has been really busy this week and swapped over the engine with our original donor car engine, one we had not run up at all, or ever heard running. On Friday came the good news, it ran and sounded OK, so back we went to Owen Developments for a more conservative remap ready to be picked up Saturday morning, still in time for Silverstone. As I turned into the space outside Owen Developments, Keith phoned me. He had just heard the news (which put him one up on me), the gearbox had broken on the rollers. I spoke to Mark, first it stuck in 5th. On stopping the engine and starting again, it went back up through the gears, then it locked stalling the engine. Then there were unpleasant noises! When cold it worked, at least in 1st and reverse, so we were able to load the k back on the trailer. The engine had been mapped before the gearbox gave up - slightly disappointing figures of 343 bhp at 6500 and 297 lb ft at 5500 suggest a slightly worn engine, and one that will need revs. Still producing 320bhp at 7000 rpm. Back at Auto Integrale, decisions had to be made. A six speed Fiat Coupe gearbox had been offered to us a few weeks ago but was declined as the gearing was identical to our first five with sixth being an overdrive good for 180+mph, and the diff about 2% lower, almost negligible. But now it made sense as its allegedly a Getrag design and almost indestructible. We could possibly have picked up the gearbox and fitted it late Saturday night, but sometimes you have to know when to pull the plug. 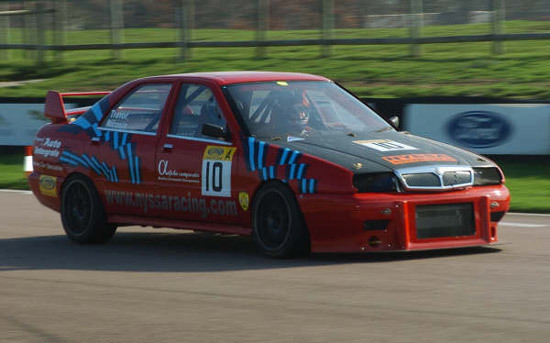 So we missed Silverstone, but expect to have the new box in for Castle Combe next week.